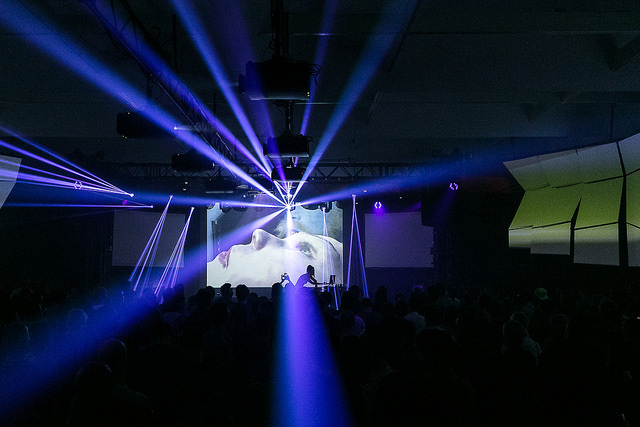 ICAS Radio revisited MUTEK in early June 2016 following their last visit in 2012 to present a radio show focused on the SHAPE platform for innovative music and audiovisual art, which presented a special showcase at the Montreal event this year. The radio show, hosted by Musikprotokoll‘s Susanna Niedermayr and CTM Festival‘s Oliver Baurhenn, features three SHAPE artists: the Mexican Prague-based multimedia artist Laura Luna, Swedish producer Peder Mannerfelt, and French maverick Jackson who presented his installation/light show Light Metal Music at MUTEK. You can hear excerpts of the aforementioned performance as well as an excerpt of Laura Luna’s live show tonight (17 June 2016) starting at 23:08 CET on ORF’s OE1 radio station. Aside from SHAPE, ICAS Radio will also present several active figures on the vibrant Montreal music scene (Kara-Lis Coverdale, Essai Pas, etc) as well as MUTEK’s VR Salon. For more information, please visit the website of the broadcaster (in German) here.